President Putin has hailed the Ukrainian president-elect’s “plan” to resolve crisis in the country, stressing that Ukraine should start internal dialogue, and that Russia is not a party to the conflict. Vladimir Putin and Ukraine’s president-elect Petro Poroshenko have briefly spoken on the sidelines of the D-Day anniversary celebrations in Normandy. Speaking at a press-conference later on Friday, Vladimir Putin told journalists that he welcomes Poroshenko’s "positive thinking" on resolving the Ukrainian crisis and his position that the bloodshed “should be immediately stopped.” He, however, did not give any details of the plan, saying that journalists should ask Poroshenko himself if they want to know more. Putin has stressed that there should be negotiations between Kiev and eastern Ukraine, and Russia is not part of their domestic conflict. 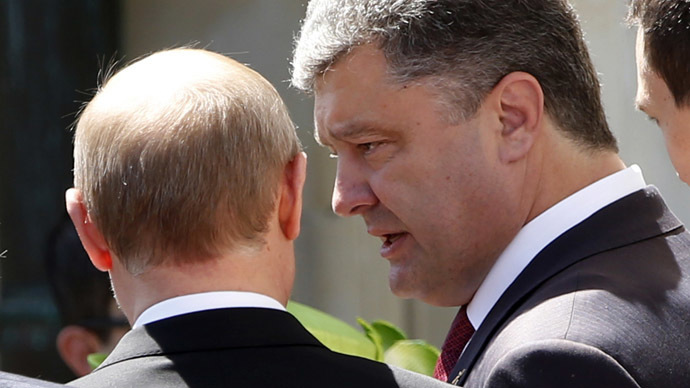 The Russian president has called on the Ukrainian government to move on “to substantive work” with the people. “No one has suggested anything concrete to the people of the region,” he said. 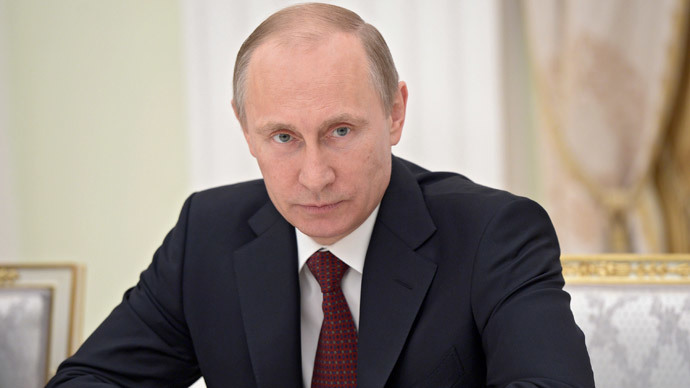 Putin has also stressed that Kiev should immediately stop its “punitive operation” in the east of Ukraine. Russia is also waiting to see thorough investigations of violence in Ukraine, including the deadly fire in the Odessa Trade Unions building on May 2. In general, Putin said, he liked Poroshenko's attitude and if he follows this course, the conditions will be created for the development "of our relations, in other fields too." "I can’t tell exactly how this will be implemented, but, in general, I liked the attitude. It seemed right to me and if this is what really happens, there will be conditions created to develop our relations in other fields too,” Putin said. Vladimir Putin also touched upon economic relations between Moscow and Kiev, in particular, referring to Ukraine’s association with the EU. "As soon as the treaty is signed and comes into force, we will be taking measures to secure the [Russian] economy,” Putin said. Apart from his conversation with Poroshenko, Russia’s president also held meetings with French President Francois Hollande and German Chancellor Angela Merkel. “On the margins of a lunch on the occasion of the 70th anniversary of the D-Day landings of Normandy’s allies, President Putin had a short talk with Francois Hollande, Angela Merkel and Petro Poroshenko,” Peskov said. As President Putin himself noted, the most substantial dialogue he had was with President Hollande. “We spoke in more detail about bilateral contacts, about economic ties and international problems, including the Iranian nuclear issue and Syria and also on some other issues, which are in our mutual interests,” Putin told reporters. The brief negotiations were followed by a short meeting between Vladimir Putin and his American counterpart, Barack Obama. According to a White House official, their informal meeting lasted 10-15 minutes, Reuters reported. "Despite that there was no separate meeting [scheduled], the leaders of the two states had an opportunity to share their views on the situation in Ukraine as well as on crisis in the east of the country. Putin and Obama have spoken for the necessity to reduce violence and military actions,” Peskov said. 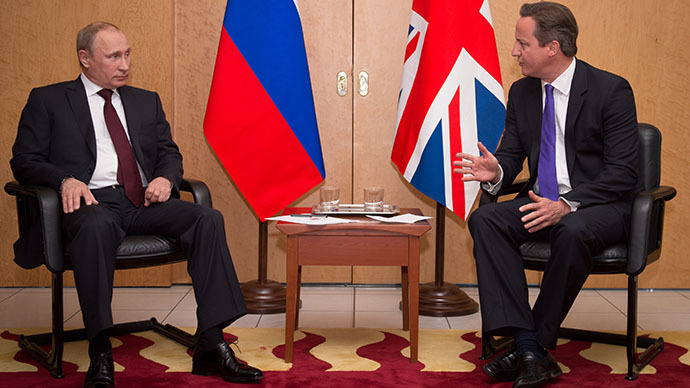 On Thursday, the Russian president also spoke with UK Prime Minister David Cameron. The two met at Charles de Gaulle Airport near Paris, where they arrived ahead of the D-Day commemorations. The meetings between President Putin and major world leaders on the sidelines of the D-Day commemorations come shortly after the G7 summit in Brussels, where Russia was not present for the first time in 17 years. 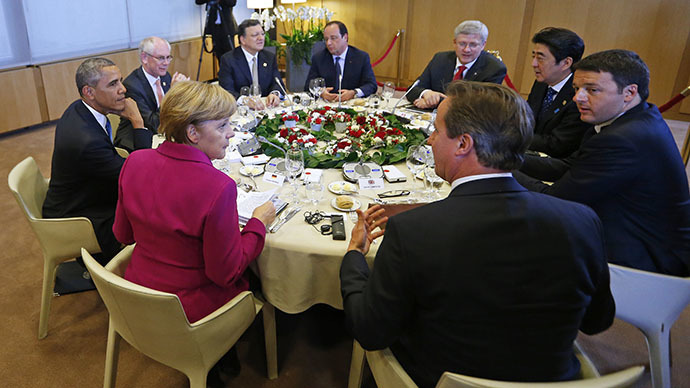 The G7 leaders condemned Russia’s “continuing violation of the sovereignty and territorial integrity of Ukraine” and threatened that more sanctions would follow unless it helps to deescalate the ongoing crisis in Ukraine.